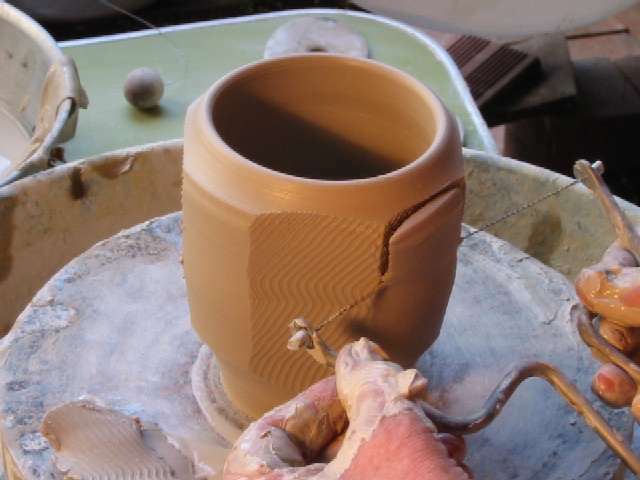 This Tutorial illustrates how I soft-facet bowls with the WireTool. L 208 : "This shows both the shape I am going to make and the chuck used in trimming it. 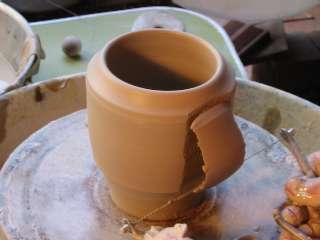 Throw a chuck on a batt before starting your bowls, and bring it to leather hard before the bowls reach that stage. 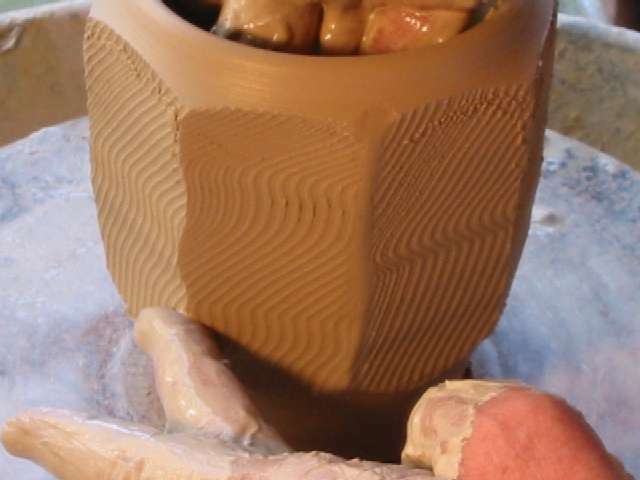 You can keep your chuck wrapped in two nesting plastic clay bags for weeks at a time." 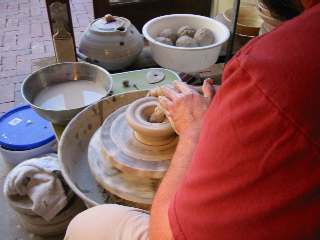 S(159) A two-and-a-quarter pound ball of clay is centered and opened in a bowl shape, leaving about half-an-inch of clay in the bottom. 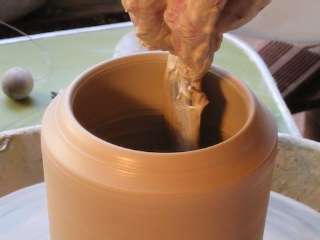 S (161) The first pull brings it up into a thick cylinder. S(187) A wooden rib helps thin the foot area, leaving the wall above roughly finger thickness. S(189) A further pull with the rib achieves final thinness in the lower part. 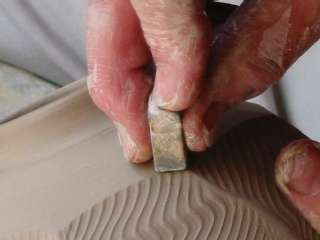 L(Profile190) The rib is used to clean the thick upper wall of finger marks, while not thinning it. 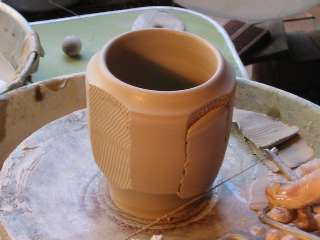 This is the portion that will be faceted. The brown line shows the approximate inner profile. 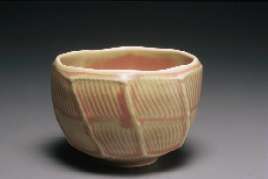 S(192) The rim is given a beveled-in shape with a chamois. S(166) The rib cleans up the finger marks on the inside. Be sure to erase especially the marks near the bottom third of the shape, as they are impossible to remove once the faceting has begun. S(167) Chamois the lip as shown. 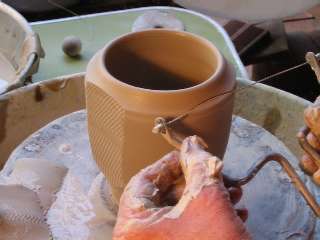 S(168) Hold the WireTool as shown, and cut down the side of the pot about one third to halfway through, while making wavy back-and-forth movements. 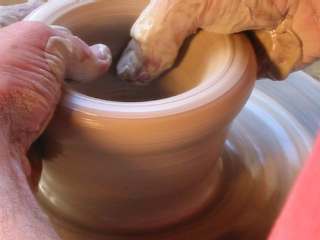 You will really have fun experimenting with these movements, and try to make the facets as even in thickness as you can, and the same width also. 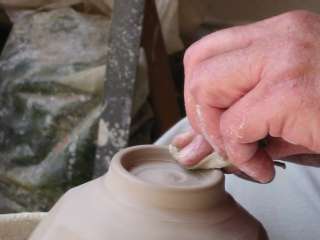 Eveness here will help in opening the form later. 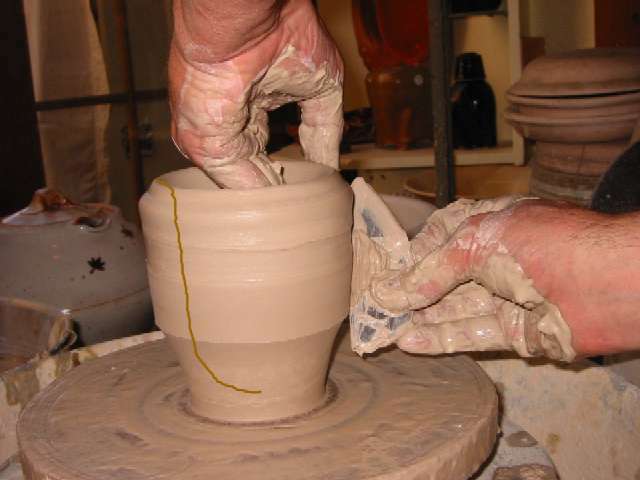 S(171) The pot is rotated 180 degrees to make the second facet on the opposite side in the same manner as the first. S(172) The wheel is rotated 90 degrees to make the third facet. S(173) Then 180 degrees to make the fourth facet. 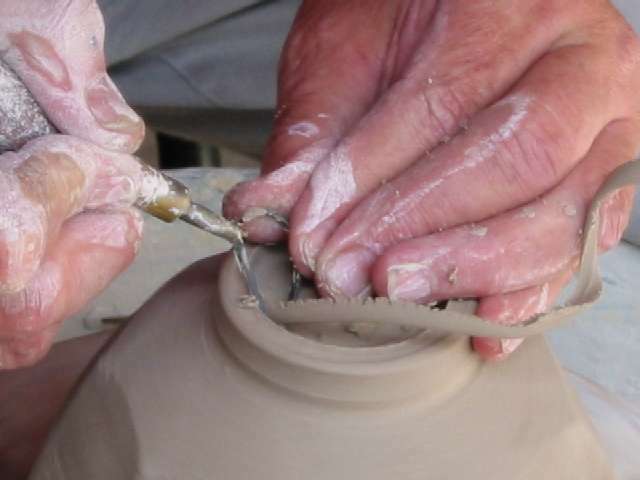 L(174) Now you can make the remaining four facets between the ones you have already made. L(175) Once all eight facets have been made, smooth the vertical edges with a damp finger to remove the sharpness there. 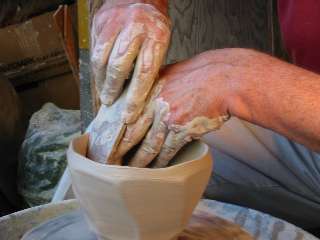 This creates a hand-friendly surface. S(176) True up the rim with the chamois, without touching the faceted area. L(177) Use a large dull wooden rib to stretch the wall out and widen the shape. 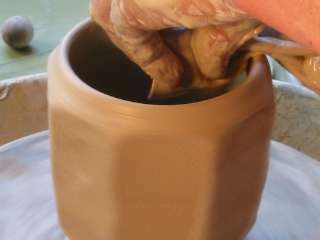 I use the fingers of my left hand inside and behind the rib to steady each other and create even more drag on the wall. 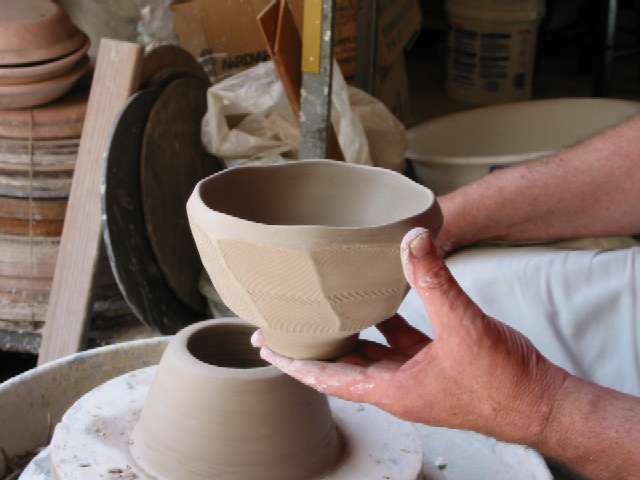 This helps to create a twisting movement between wheel head and rim. you can see this twist clearly in the last picture of this sequence. S(179) Open again, even wider. 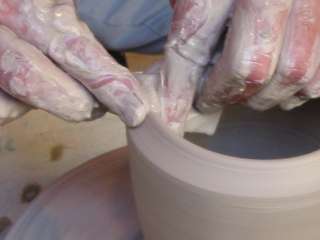 You will begin to see the rim begin to "drop" between the thick parts, creating a lovely undulation. S(181) Open to the final, widest shape. 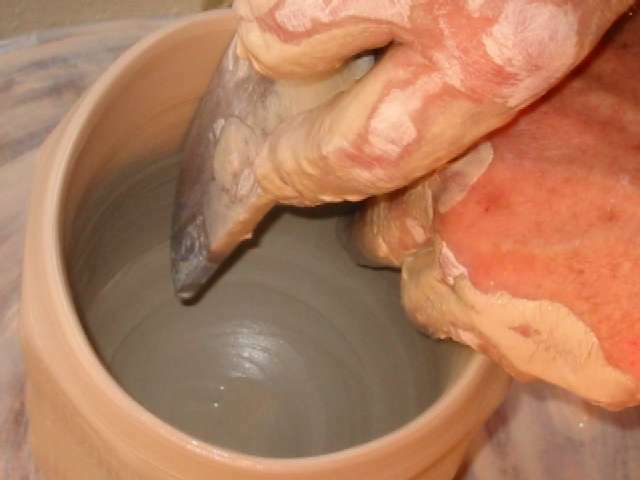 S(198) Use the chamois to cleanup the rim, without touching the faceted area, and do this slowly and carefully so as not to flatten the undulations. 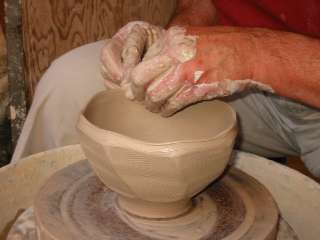 Then cut the bowl free of the wheel head and set on board to dry. I generally make twelve at a time in two rows. Once the rims have set up firmly, turn upside down onto a board covered with one inch foam rubber. I like to shuffle them at this point. 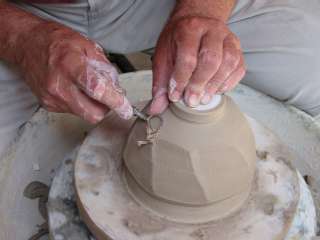 That is, the corner pots are moved to the middle, the middle pots are moved to the outside, and the parts facing the inside are turned to face the outside. 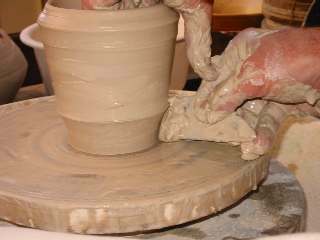 This keeps them drying equally, so all arrive at the proper trimming consistency at the same time.The foam rubber prevents flattening of the lovely rim you made earlier, and the shuffled pots are allowed to dry until ready for trimming. 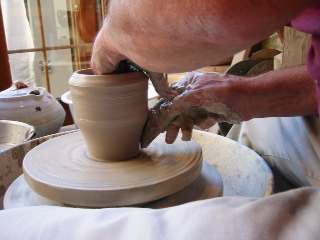 L(200) I center a leather hard chuck on the wheel and place the bowl upside down on this while tapping into center. 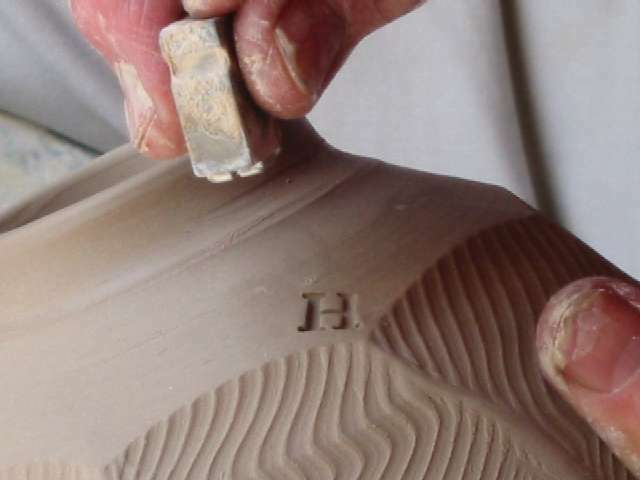 Then tap down lightly to æfixÆ it to the chuck. I use a small disc of plastic for a frictionless rest for my steadying, left fingers. 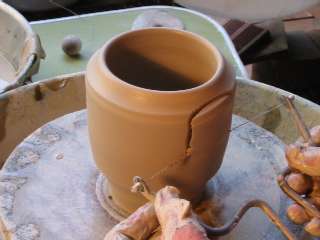 S(206) Trim the outside bottom of the bowl to correct thinness, removing the bowl if needed to check this. You can always tap it back on. 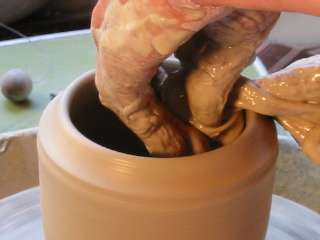 L(207) Remove plastic disc and trim out the foot. I use a Bison Tool because of its superb wear quality. Have done around 5000 pots with this tool and it is still sharp! Contact "Philip Poburka" < pdp1@earthlink.net> to get one. S(202) Chamois the foot to soften its profile, so it will feel hand-friendly after the fire. S(203) Stamp your maker's mark. L(208) The finished bowl and the chuck it was trimmed on. 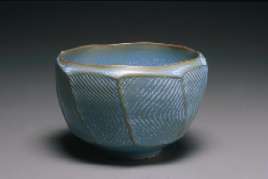 You can see how the wire cuts stretched out during the opening phase to create wonderful surfaces for the glaze to reveal in the fire. The undulations of the rim are pretty wonderful also! 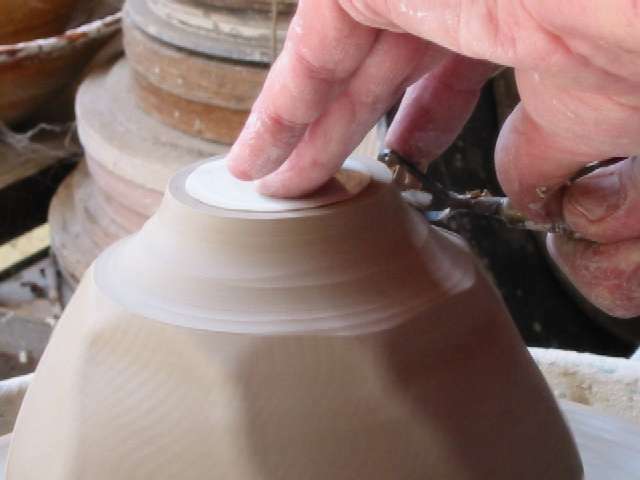 The magic in this process is due to the faceting of the clay while soft, and later stretching of those facets.